This past week the paths of two teenagers tragically crossed when sixteen-year-old Conor Lynch attempted to run across Woodman Avenue where he was hit and killed by a car driven by an eighteen-year-old motorist who then fled the scene. The LA Times ran a brief article that included a quote from the LAPD indicating that Conor "was jogging across Woodman Avenue midblock and not at a crosswalk." This simple statement set off a flurry of reader comments that demonstrates the mythology of crosswalks and the subjective nature of transportation engineering. The readers can be divided into two camps; those who empathized with the motorist and those who empathized with the pedestrian. To be sure, it was evident that all agreed that the events were tragic all around but the blame was frequently assigned to one or the other party based on understandings or misunderstandings of the law regulating the simple crossing of a street. Some readers saw the jaywalking as indicative of fault, commenting "If it is true that Conor was jaywalking then it was his fault and I feel really bad for Moran." Others saw the motorist's behavior as the cause, commenting "People drive too fast in the rain and careless all day and night in Los Angeles." The details of the incident are still under investigation but it is apparent that attitudes and opinions vary widely on the rules of the road, the definition of jaywalking and the efficacy of crosswalks. Rules of the Road: Pedestrians are permitted to cross the street mid-block. The exception is in locations that are between intersections that are controlled by traffic control signal devices or law enforcement officers. Obviously, it's never a good idea to step out into the street without checking for traffic, but the notion that mid-block crossings are illegal is simply incorrect. Streets are for crossing, at the intersections in marked crosswalks, at the intersections in unmarked crosswalks, and also in between if the adjacent intersections aren't traffic signal controlled. In other words, the standard is: our streets are crossable unless restricted. Definition of Jaywalking: Some people refer to pedestrians who cross the street against a red light "Jaywalkers" while others use the term for those who cross the street outside a crosswalk. Either way, it is simply a "nickname" that is not codified in our vehicle code or municipal code and is actually an antiquated term of derision. 90 years ago, a "jay" was a hayseed who didn't understand the ways of the city, typically accustomed to cutting across fields and village lots. 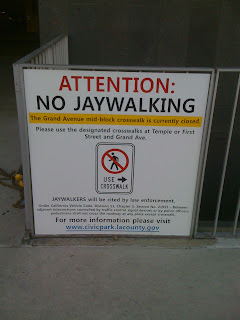 As for the definition of jaywalking, it's vague and varies, and is about as useful as a discussion of jaydriving. In other words, it reinforces attitudes without clarifying the rules of the road. 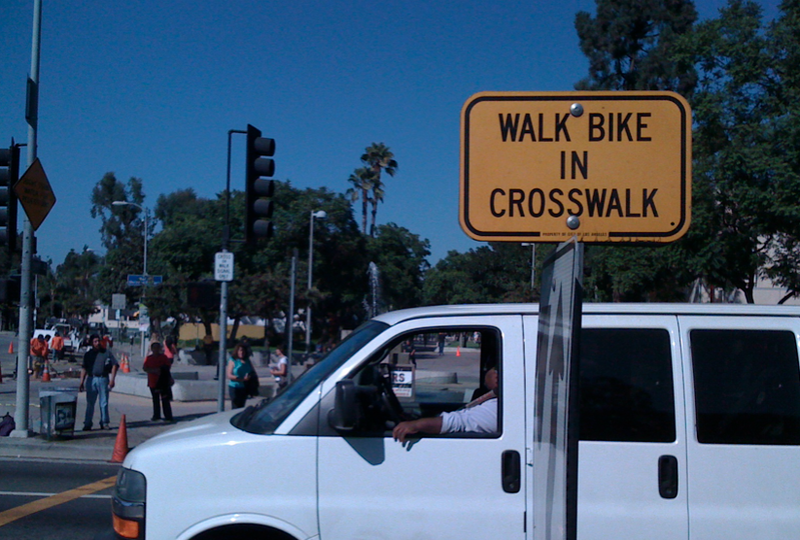 Efficacy of Crosswalks: The City of Los Angeles has long been engaged in a debate over crosswalks and their usefulness, resulting in the see-saw battle that sees some advocating for the addition of more crosswalks while the LADOT looks for opportunities to remove crosswalks. A visit to the City Council's Transportation Committee will yield a wealth of transportation mythology that supports increase of speed limits and addresses the dangers of crosswalks with the explanation that "Crosswalks give pedestrians a false sense of security." 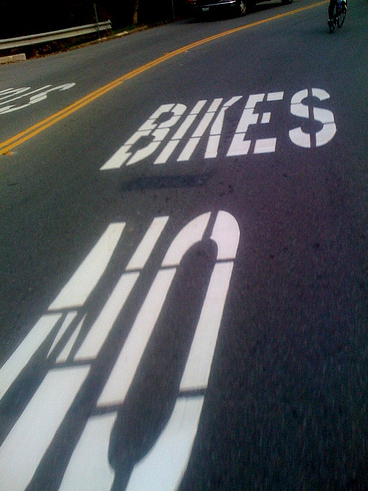 This phrase has been repeated by transportation engineers and then parroted by councilmembers for so long that it has become accepted as the truth and serves as the core bias that supports the current campaign to increase speed limits, widen streets, and remove crosswalks. The "false sense of security" theory can be traced back to the 1972 "Herms Study" which included a bit of unfortunate speculation that has taken on a life of its own. When Herms discovered that there were more pedestrians struck (per person crossing) at marked crosswalks than at unmarked crosswalks, he failed to account for the fact that the crosswalks are typically installed where pedestrian/vehicle conflicts are an issue. That unfortunate open question has been misinterpreted to the point of absurdity, motivating an entire generation of traffic engineers to dedicate their careers to removing marked crosswalks and failing to provide new ones, all in the misguided belief that they are dangerous and that pedestrians are better served on unmarked crosswalks. 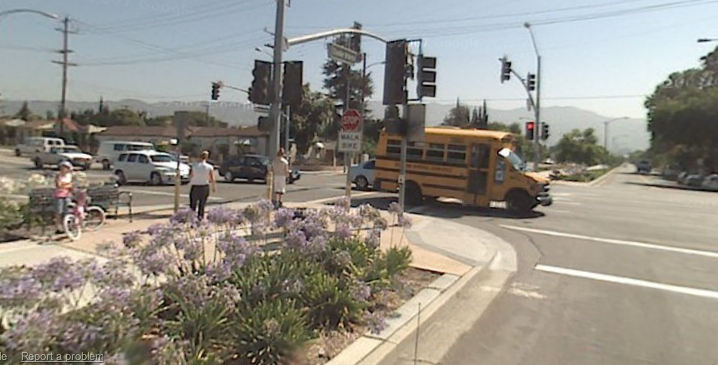 Our councilmembers are quick to reject community pleas for safer streets by stating authoritatively "Our studies show that there are more injuries to pedestrians when there is a crosswalk than when there is no crosswalk. You see, crosswalks give pedestrians a false sense of security." This is typically followed by a "yea" vote on speed limit increases and street widenings. At issue is the simple fact that our streets are dangerous, not just for pedestrians, but for everybody. As speed limits increase, motorists have less time to react to pedestrians and require more distance to stop. Last year the LAPD conducted a pedestrian sting on Reseda Blvd. 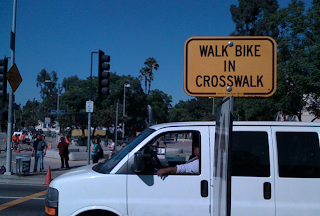 An LAPD officer in plain clothes would cross the street in the crosswalk and motorcycle officers waiting on the side streets would cite motorists who failed to yield to the pedestrian. The LAPD couldn't keep up with the violators. The unfortunate thing about this sting is that many motorists were traveling under the speed limit but they didn't have the reaction time or the stopping distance necessary to make a safe stop before the crosswalk. Watching a City of LA vehicle skid to a stop, it was apparent that this street was engineered for conflict. It's evident that the rules of the road are widely misinterpreted by the general public, typically reinforcing our particular perspective or bias. 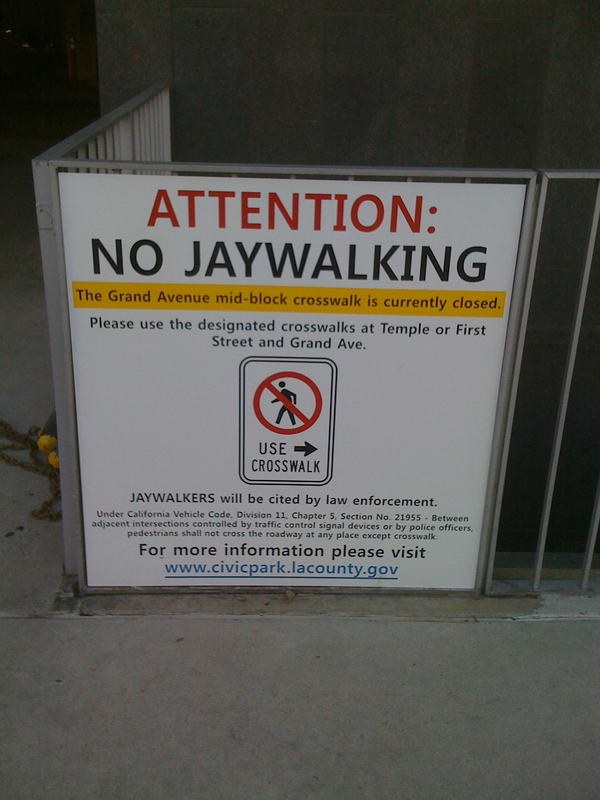 The term "jaywalker" is often used but rarely understood, further perpetuating misunderstandings between motorists and pedestrians. Of greatest concern is the fact that our streets have become politicized, with traffic control decisions being made by people who simply repeat old fallacies in support of the current paradigm of traffic control and the resulting engineered conflict. The tragic death of Conor Lynch has stirred a debate in our community over how the streets should work and how pedestrians and motorists can both find their place in the mix. It's a worthy conversation and the simplest way to honor Conor is to seize this moment and to work together to make our streets safer for everybody. Hollywood & Vine's "Hollywood Bike HUB" is on its way to the Metro Board for final approval, having just picked up an endorsement from the Metro's Planning & Programming Committee along with a recommendation that it serve as a "demonstration project" in the establishment of transit oriented development (TOD) standards. The Hollywood Bike HUB is a bike shop for locals where cyclists can work on their bikes as well as store them in a secured environment. The Bike HUB would also offer a Bike Share for residents and a Bike Rental for tourists. In addition, the Bike HUB would serve as a Visitor's Center for tourists who simply need info on the neighborhood. The Hollywood Bike HUB is good for cyclists, good for residents, good for tourists, good for business and great for transit, offering Metro passengers a "last mile" option. One would think that bike storage would be a basic for Metro transit hubs, especially when surrounded by TOD but such was not the case at Hollywood & Vine. The Hollywood Bike HUB journey began earlier this year, about the time that we should have been celebrating the centenary of the Hollywood & Vine crossroads. Instead, all eyes were on the ribbon cutting at the W Hollywood's four acres of TOD, representing the collective machinations of the City of Los Angeles, the CRA, the Metro, and the Developers, and two-thirds of a billion dollars in funding from sources that included ARRA, Calpers, and the CRA. The W Hollywood, from the hotel to the condominiums to the apartments, claims to channel the Hollywood spirit, connecting to Hollywood's heyday and "infusing it with the contemporary innovation, energy, elegance, and excitement" of the W experience. Metro officials positioned the integrated Hollywood & Vine Red Line station as a "flagship transit HUB," one that sets a standard for multi-modal connectivity. None of this resonated with the pedestrians and cyclists who noted that the promised intersection improvements failed to materialize, that the promised bike-share and car-share facilities failed to happen, that the public space was surrounded by fortress walls of exclusivity, and that cyclists were obviously an afterthought as evidenced by the lack of bike racks or bike storage. 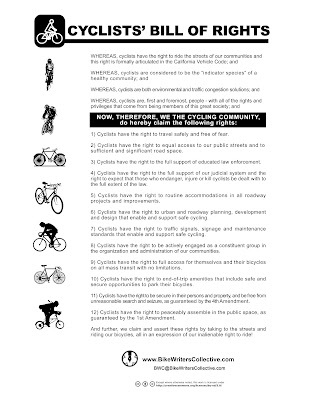 I spoke up and pointed out that waiting until after the ribbon cutting to ask "Where do the cyclists fit?" 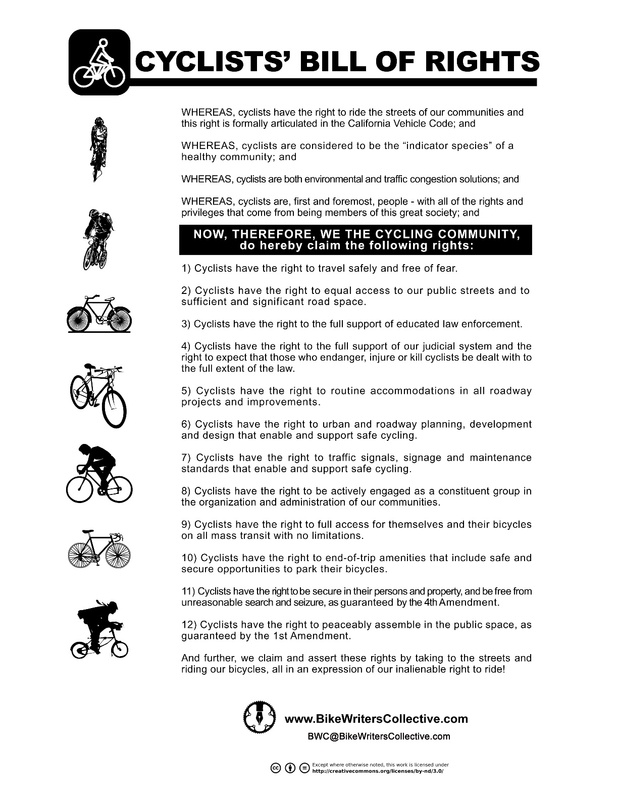 is hardly a demonstration of a multi-modal commitment. While the issue of bike parking facilities at Hollywood & Vine was the immediate challenge, the larger problem was the simple fact that TOD projects are being built throughout the county, (35 underway, 17 more on paper) and yet there are no Metro TOD standards in place. Developers qualify for funding based on their promises of TOD facilities, improving their position by writing "public benefit" into their proposal, yet without standards in place, it's a soft claim with little meaning. Hollywood & Vine proves the point. While advocating for TOD standards, I proposed several locations for the Hollywood Bike HUB, a bike facility where people could not only safely park their bikes, but also rent bikes, get minor repairs done, and buy bike accessories, such as lights, patch kits, pump, etc. to make their commute more convenient, comfortable, and safe. Over the past year, I've been joined by Enci of illuminateLA, Ron Durgin of Sustainable Streets, Glenn Bailey of the LA Bicycle Advisory Committee, Bart Reed of the Transit Coalition and Jeremy Grant of the LA Bike Working Group. The struggle to incorporate robust bicycle facilities at the Hollywood & Vine station took us on a journey that included meetings with Metro staff, the developers, the tenants, the Sheriff's Department, the CRA, the City Council, the LADOT, and anyone else with a finger in the pie. Ultimately, it was the Deputy Mayor Jaime de la Vega and Metro Boardmember Richard Katz who embraced the vision of the Hollywood Bike HUB and the notion that TOD standards should drive the development process, not simply be added as a garnish at the ribbon cutting. To that end, Jeremy Grant developed the Hollywood Bike HUB renderings that went to the Metro Board this past week and the Planning and Programming Committee approved the Hollywood Bike HUB concept, sending it to the full Board this Thursday morning for final approval. "Direct staff to develop the Hollywood Bike HUB as a demonstration project, engaging the public and using the process to develop robust TOD standards that provide systemic commitments to pedestrians, cyclists, open space, connectivity, accessibility, and community benefit." The Hollywood Bike HUB is located on the east side of Vine Avenue, just south of Hollywood Boulevard. With over a thousand square feet of interior space, the HUB is a commitment to connectivity, literally and figuratively. Guests will have access to showers, lockers, activated public space, and local information services, all as elements of the HUB's commitment to connectivity. The intersection of Hollywood & Vine was born 100 years ago when the City of Los Angeles annexed Hollywood, renamed its streets, and ushered in the Golden Age of Hollywood. Griffith, Pickford and Sennett came to town. Radio Stations proudly announced "Broadcasting live from Hollywood & Vine!" Record labels and production companies commissioned architects such as Schindler, Neutra, and Naidorf/Becket. Charlie Chaplin and Will Rogers kept offices in the Taft Building along with neighbors such as the Academy of Motion Picture Arts and Sciences. The intersection grew to become one of the busiest in the city and one of the most famous in the world. Hollywood & Vine has seen the glamor days of Clara Bow's It Cafe, the Brown Derby and Sardi's. It has also seen tough times with businesses closing, buildings falling into disrepair, sidewalks cracking and crowds toughening. Through it all, it has maintained its status as the center of Hollywood, crossroads of hopes and dreams for people from around the world. I believe that the crowd-sourced solutions that brought the Hollywood Bike HUB to the Metro Board are an example of all that is great about Hollywood and evidence that Hollywood is reclaiming its title as the center of the creative universe. When departments within the City of Los Angeles fight with each other, their warlords take the struggle for turf into local neighborhoods and the streets of LA become battlefields where quality of life is written off as collateral damage. The casualties are the residents and business operators, because city attorneys work overtime to minimize departmental liabilities. On battle scarred Hollywood Blvd., locals navigate this eight foot excavation pit that bears witness to the no-man’s land that separates city departments from collective accountability and the responsible delivery of city services. Weeks have gone by and the pit sits as a quiet reminder that the City of LA can take a sidewalk out of compliance and then simply drive away, violating its own standards and demonstrating the need for greater connectivity at City Hall. The pit's origins lie in the Fire Department's construction of Regional Fire Station #82, a 32K square foot facility funded with $30 million of Prop F money that is 18 months post-groundbreaking. The effort is administered by the Department of Public Works and involves Contract Administration, Engineering, Planning, General Services, Transportation, Street Lighting, Street Services, and a host of Contractors and Sub-Contractors. A simple boring project by sub-contractors in order to install a Fire Department traffic control override system resulted in the discovery of lead covered conduit of unknown origin. By law, contractors notify the DWP upon discovery. 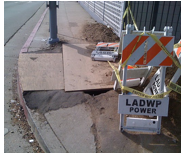 The DWP then takes control of the site to determine what's underground and who the owner is. The DWP excavated, they deliberated, and they evacuated. They left behind a plywood covered pit, crumbling asphalt, a berm of dirt and cement debris, and the obligatory misplaced DWP barricades and caution tape. Weeks have gone by. A city official described working with the DWP by comparing it to the Roman Army. "Decentalized command with autonomous Generals running their own battalions, you can't rely on rules and code, you have to negotiate with each commander." While private contractors are limited from street work during peak hours, from haul routes without authorization, and from street closure without permit, the DWP is charged with operating to their own authority. In situations such as this, contractors and sub-contractors are prevented from completing their work, setting them up for claims against the city for the additional cost of pulling crews off jobs and standing by while the city of LA appears on Family Feud. The irony of the departmental liability battle is that each department is represented by diplomatic forces that come from the City Attorney's office. While it's unclear whether the attorneys consider the City of LA or the specific department to be their client, it's abundantly clear that they do not serve the people who live and work in LA: A city under siege. • Fierce defenders of specific programs storm City Hall to defend libraries or cultural affairs or parks or any of the many threatened city services that the City Council puts up on the "budget dust" chopping block as a token sacrifice toward a balanced budget. • Big picture advocates argue for systemic solutions that range from long-term budget commitments to revised pension strategies to the implementation of greater efficiencies and accountability to a complete overhaul of City Hall. • Optimists who step out of the way and avoid the drama, joining the Mayor and the City Council in kicking the budget crisis down the road, confident that a sinking ship will eventually right itself. Neighborhood Councils have an opportunity, actually an obligation according to the City Charter, to weigh in on the 2010-2011 City Budget, and to work together to advise the Mayor and the City Council on LA's budget commitments, the delivery of city services, and the generation of revenue. The budget journey is long and complicated, but if the community wants to have an impact, it needs to start now, not during next year's budget hearings when there is nothing left but triage. • Collect the revenue! The Commission on Revenue Efficiency (CORE) just released its Blueprint for Reform of City Collections, complete with 65 specific recommendations for ensuring that the taxpayers of Los Angeles get their money's worth and that the residents and businesses of LA get a City that Works. CORE focused on the hundreds of millions of dollars on the table that go uncollected, simply because of inefficiencies in revenue collections, tax compliance, accounts receivable collections, new revenues, centralized billing, and implementation of the City Controller's audit of collection practices. • Implement performance standards, operating efficiencies, and an environment of accountability! CORE set the standard for community engagement and pursuit of a creative solution and the next opportunity is to evaluate the simple City Hall machine and the tremendous redundancy that requires a half dozen departments to engage in the process of crossing the street safely. Departments currently compete against each other, performance is not evaluated from the perspective of the community, the silo operating style bleeds money and limits the delivery of City Services. • Connect with funding sources at the Federal, State, and County levels, moving the income target off the residents and businesses. The current paradigm for revenue enhancement is to layer increasingly higher fees and penalties on top of existing taxes and licenses, charging the people of LA more for less. Meanwhile, surrounding communities such as Long Beach and Glendale go to the same funding sources and come back with significantly higher funding awards while the City of LA fumbles. The people of LA must speak up and demand an integrated funding strategy that stops LA's departments from competing with each other and from breaking the financial backs of the public. LA's City Charter mandates that Neighborhood Councils advise City Hall, that they promote the civic engagement process, that they monitor the delivery of City Services, and that they engage in the development of the Mayor's Budget. Saturday’s Community Budget Day is an opportunity for Neighborhood Councils to accomplish the entire City Charter mandate, all in one day! 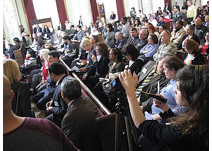 The Budget Day is open to the public and offers an opportunity to mingle with the CORE members, the Neighborhood Council Budget Advocates, the Mayor's Budget team, and neighborhood council representatives from all over the City of LA. This is the beginning of a 2010-2011 City Budget journey that is based on solid revenue sourcing and collection, that serves as the blueprint for a City that Works, and that supports a Great City commitment to the delivery of City Services. "Happy Sunday!" was the greeting on the streets of Los Angeles as tens of thousands of Angelenos walked, jogged, rollerbladed, skateboarded, cycled and dodgeballed their way along the 7.5 miles of streets opened to people for LA's inaugural CicLAvia. LA is no stranger to special events but CicLAvia was unique in many ways. The purpose was simple, to open the streets, providing people with an opportunity to create community and move freely. They did, in ways unexpected and in numbers that exceeded expectations. They greeted each other, they stopped to socialize, they paused to participate in activities along the route, they ate food from local vendors, they smiled and they filled the air with the sound of conversations, greetings and cheers of approval. Ciclovía originated in Bogotá, Columbia and they now take place around the world, typically on Sunday and featuring car-free streets and great accessible public space for activities that range from yoga and theatre to music and aerobics. 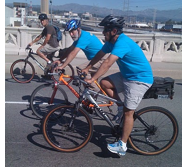 Bogotá's Jaime Ortiz, creator of the Ciclovía concept, rode alongside Mayor Antonio Villaraigosa on a ride that started in Boyle Heights and headed to City Hall. This was the Mayor's first time on a bike since his tumble in the Bike Lane on Venice Blvd … an incident that has stirred significant conversations about how our street work and where people walk, ride or simply hang out. Along the route, Brazilian Capoeira fans took over Central Ave., outdoor Yoga mellowed the crowd on 1st Street, a Comedian worked the crowd on Spring Street, the East Side Bike Club previewed Día de los Muertos, CrossFit Mean Streets turned Main Street into an outdoor gym, the Eagle Rock Yacht Club hosted a Dodgeball tournament and Chalk4Peace turned 7th Street into a mile of public participant art. The LA Times estimated the attendance at 100,000 while other media estimated a more conservative 50,000. Either way, it appears that participants showed up in huge, happy, conflict-free numbers that exceeded the Mayor's anticipated crowd of 35,000 and demonstrated that the streets of LA really are for people. The CicLAvia route went from Boyle Heights to East Hollywood, favoring park-poor communities, areas with merchants who would benefit from the crowds, streets that were pothole-free, and major routes that would not disrupt local residential neighborhoods. The "street-opening" strategy was modified from typical event street closure protocol, incorporating 14 "crossing" at key locations. Vast sections of street were car-free while motorists still had opportunities to pass through, eliminating the traditional confusion and frustration that often comes with major events. LA's CicLAvia took a couple of years of planning, requiring the concerted efforts of advocates, event planners, engineers, and community organizers along with LA's Transportation, Sanitation, Street Services, and Police Departments. Once the Mayor's team got behind it, CicLAvia moved forward, strategies were refined, streets were repaired, wayfinding was designed and volunteers were trained. CicLAvia organizers say that the tremendous success of LA's inaugural event provides momentum that will assist in their goal to host CicLAvias every two months in 2011, every month in 2012, and eventually bringing CicLAvia to the streets of LA every Sunday. CicLAvia Boardmember Stephen Villavaso summed up his take on the event saying "We presented the pilot project to thousands of smiling faces on people who came from all over the city to enjoy the streets of a wide variety of neighborhoods. Most of all, we had huge amounts of interaction on the streets with barriers taken down and we created a common shared experience." CityWatchLA - Hey LA, Let’s Sue for Transportation Malpractice! The single greatest threat to the status quo of transportation planning and development in the LA area is the Hippocratic Oath, the simple commitment to do no harm. "Primum non nocere." Imagine if all transportation projects were first screened to eliminate the twin traps of over-treatment and therapeutic nihilism. Consider the benefit to the community if transportation authorities were responsible for the unintended consequences of "the cure." The practitioners of the 405/Sepulveda Pass project would be conducting business in a dramatically different fashion if they had started the journey by taking the Hippocratic Oath. Their current loyalty is to the $1 billion contract that directs the widening of the 405 in order to accommodate a northbound car-pool lane from the 10 freeway to the 101 freeway, not to the community it impacts. When the "treatment" is completed, three bridges will have been replaced, 27 on-ramps and off- ramps will have been adjusted, and 13 underpasses and structures will have been widened. When the "patient" awakens, freeway traffic will exit on "improved" off-ramps, entering the local community at freeway speeds. Enhanced integration between the freeway and adjacent streets will support local freeway-alternative traffic congestion. Widened streets with faster traffic will eliminate pedestrian traffic and render mass transit access obsolete. The practitioners of the Gerald Desmond Bridge replacement would be developing a completely different project if they were to apply the simple standard of leaving things better than they found them. The current bridge has features that the proposed bridge lacks, resulting in a project that includes "engineered conflict." The "patient" has long objected that the proposed bridge fails to plan for all modes of transportation and does not replace the current existing pedestrian walkway. Community members also point out that the proposed bridge fails to address a vision for connectivity, options for the future of Terminal Island. Project Managers dismiss the complaints as unnecessary, pointing out that it's simply a shipping route for trucks. The Long Beach City Council agrees with the community and had to take formal action, simply to request that existing features be retained in the future. They concur with the Coastal Commission in recognizing that a $1 billion investment in connectivity is a half century commitment to the future of Terminal Island and to restrict that vision is to damn the "patient" to a life of shipping container storage. Other projects such as the Santa Monica Boulevard Transit Parkway and the Sepulveda Reversible Lane demonstrate that there is no greater power than a funded project. In both cases, the inadvertent identification of a specific element required its inclusion in the final project, regardless of its appropriateness, simply because it was funded as named. The Santa Monica Boulevard Transit Parkway has 100 yards of dedicated Busway on the eastbound end of the 4.5 mile project, the last vestige of the original $93 million Busway project that proposed a bus lane down the center of Santa Monica Boulevard, from Beverly Hills to the 405. It's there to qualify for the funding, not because it belongs or serves any purpose. The Sepulveda Reversible Lane has been reduced to 100 yards inside the Mullholland tunnel, the last vestige of an $11.3 million project that proposed reversible lanes from Wilshire Boulevard to Mullholland Boulevard. The project was funded, it has been absorbed into the 405/Sepulveda Pass project, and the reduced reversible element exists simply to qualify for the funding. These projects demonstrate the need for a new paradigm for transportation planning and development. 1) The community benefit must be required, not negotiated. The W Hollywood Hotel has already experienced its first pedestrian death, caused by a truck driver leaving the facility and running over an old lady in the crosswalk. The negotiated "community benefits" included intersection improvements at all four corners, bulb-outs, ped scrambles, etc. but none of them "penciled out" meaning the developers do this for a living and the community is out-gunned. 2) The project must actually be an improvement, not simply an effort to churn funding. Funded projects that inadvertently include obsolete elements are dead. Improving the community is the objective, not simply funding transportation departments. Design & Build mandates encounter Stall & Defend opposition from the local community because they fail to consider the unintended consequences. 3) The project must leave the community better than before, not as the result of community intervention, but as the result of a simple guiding principle that is in the DNA of the project. The impact to the local community must be a priority and solutions that sever routes, restrict access, and increase cut-through traffic are not solutions, they are problems. The largest developers in our community are Caltrans, Metro, and the CRA. The most significant amount of public money being spent on development is dedicated to transportation and transportation related projects. The greatest opportunity to improve the quality of life in our neighborhood is through responsible transportation planning and development that is community oriented. The current struggle for the development and implementation of standards for Transit Oriented Development is left to the community while Metro and its development partners charge ahead. The current struggle for traffic congestion relief that actually improves conditions instead of simply moving the problem to adjacent streets is left to the community while the Department of Transportation charges ahead. 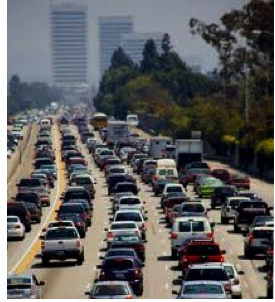 LA's future as a Great City demands that all transportation development continue with a "do no harm" mandate and that it is supported with real community benefit standards as the foundation for progress, not simply the fallout of long protracted battles with the neighborhood.